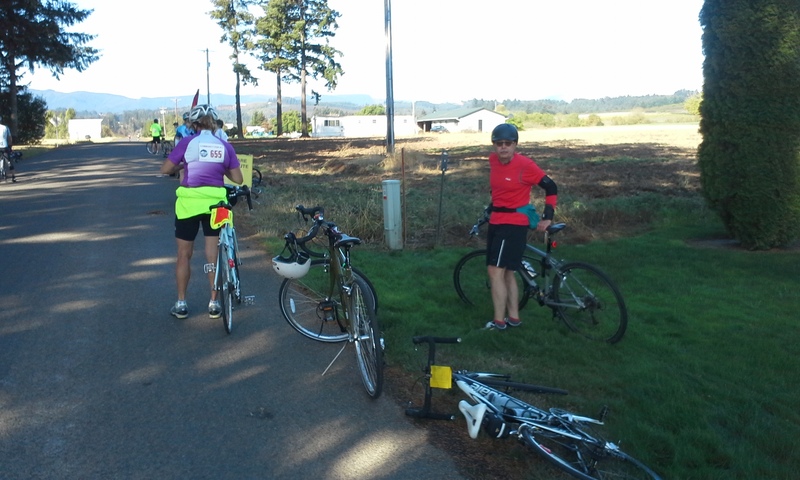 My last organized bicycle ride of 2014 — the Harvest Century 45-mile route through Washington County’s wine country west of Portland on Sunday, Sept. 28 — was one of the year’s best. A year ago, this event was canceled due to the threat of dangerous windstorms in the area, which includes farmland, vineyards and the cities of Hillsboro and Forest Grove. But in 2014, the sun brightly shone and temperatures remained nicely in the 70s. 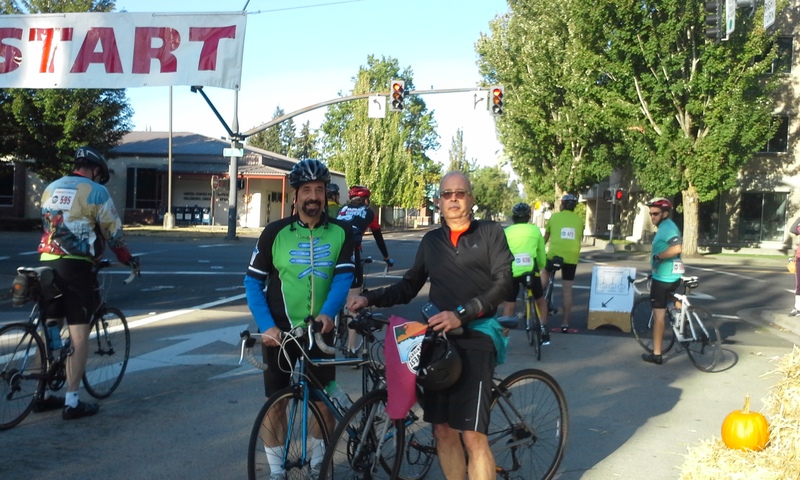 I did this ride with my brother Mark for a second straight time — we did it before in 2011 on slower hybrid bikes. Both of us now have Trek road bikes and more riding experience (for me, this was my 17th organized ride since I started doing them in 2011). It was nice to have a riding partner. On a relatively flat course, we both shaved up to an hour off our 2011 times. I finished in 4:43, counting stops, and averaged at least 11 miles an hour. The Harvest Century ride is a benefit for Community Vision, a Portland-based nonprofit that supports people with developmental disabilities. 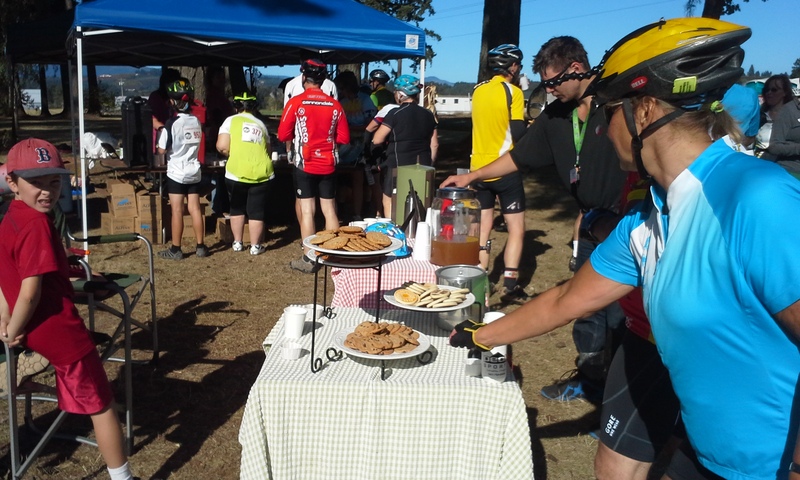 It drew several hundred riders on a warm, sunny day to do the 100-mile, 75-mile, 45-mile or family ride (3-mile) courses. 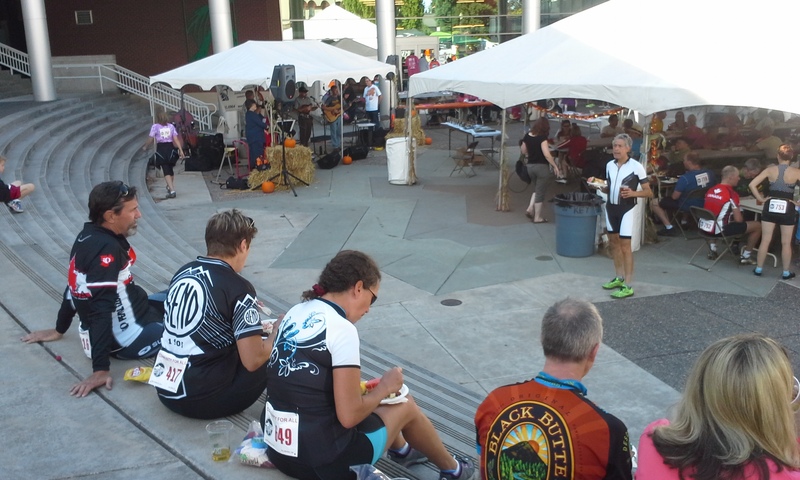 All routes began and ended at the downtown Hillsboro Civic Center, where they fed us well afterwards with brats, salad and beer. After doing two centuries (Flying Wheels and Seattle to Vancouver, B.C.) already this year, I was happy to do a shorter ride. Good thing, because I had to get back home in Bellevue to start a new job the next day as a marketing program manager at Allytics in Redmond. This ride had a stretch of rolling hills, but no major climbs, and the last 10 miles or so were flat and fast as you rode back into Hillsboro from the south side. 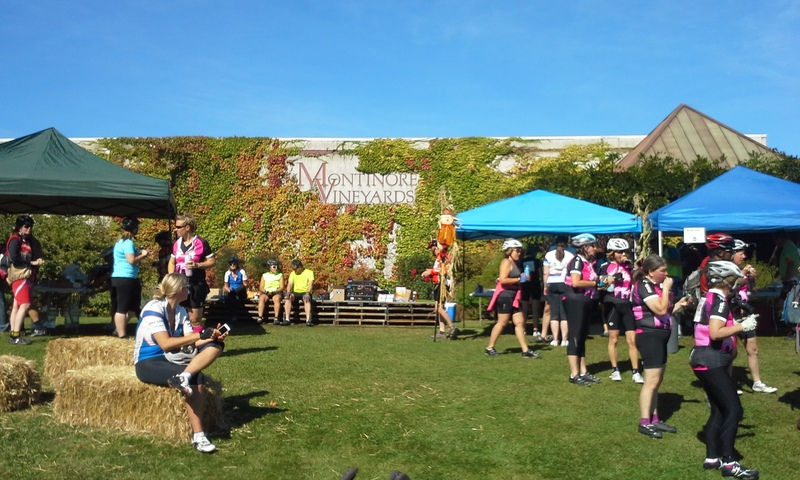 What set this ride apart from others is the second of two rest stops — at Montinore Vineyards just south of Forest Grove. You could get water and food, or … you could go inside the winery for a tasting. Mark and I did just that again, as we did in 2011, paying $5 each for a sampling of five different Montinore wines (three whites and two reds). It wasn’t much, but it tasted great and hit the spot. Now that we have done this twice, I’d call it a tradition. One more thing: Nice to see lots of women doing this ride! The men-to-women ratio seemed closer to 50-50 than I’ve seen in all my previous rides. I’d love to do this ride every year, but you can’t count on the weather in late September always being this nice. When it is, this event is a very good time. What’s next? Got to publish this, and get ready for the Issaquah Run With the Fishes 5K on Sunday, Oct. 5. After that, more running through the end of the year, including (likely) the Seattle Half-Marathon. The bicycle season, outside of some leisure rides, is finished until the 2015 Chilly Hilly in February. This entry was posted in 5K, Bicycling, Century, Chilly Hilly, Flying Wheels, Harvest Century, RSVP, Running, Seattle Marathon and tagged 5K, Bicycling, Chilly Hilly, Flying Wheels, Half-Marathons, Harvest Century, Portland, Running, Trek. Bookmark the permalink.